Uttar Pradesh- India’s largest state electorally, will see polling in seven phases in the upcoming General Elections -2019. During the first phase, polling will be held for eight Lok Sabha seats namely– Saharanpur, Kairana, Muzaffarnagar, Bijnor, Meerut, Meerut, Baghpat, Ghaziabad and Gautam Buddha Nagar - all in the western Uttar Pradesh. 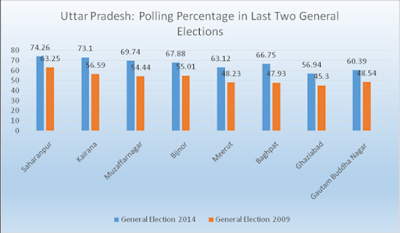 As per the data sourced from the ECI website, polling percentage on all eight seats was higher in the General Elections -2014 than the General Elections -2009. In 2014, highest polling percentage among these eight seats was seen by the Saharanpur parliamentary constituency at 74.26 percent.